The University of Wolverhampton is set to reveal the findings of its recent research project to understand what specific smells belong to the Black Country, and what memories they evoke in Black Country locals. The research results - including the top 5 Black Country smells - will be unveiled on Friday 1st February as part of the Wolverhampton Literature Festival between 5.00 pm and 6.00 pm at Wolverhampton Art Gallery. 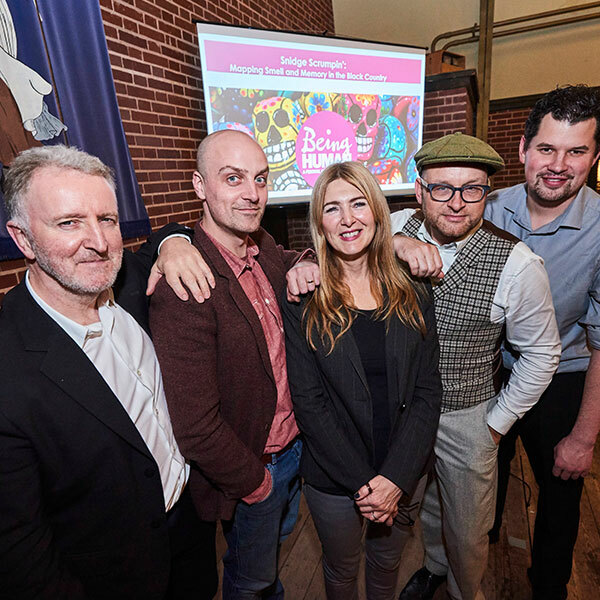 University Psychologist Dr Tom Mercer has analysed the data collected at both events and will reveal which particular Black Country smells resonated with the participants, and which odours triggered strong, emotional memories with the locals. To accompany the unveiling of the experiments, three local writers have been commissioned to write short pieces on their olfactory associations with the Black Country. To celebrate the success of the research, Kerry Hadley-Pryce, Robert Francis and Liz Berry will perform their work at this event. Picture caption from left to right: Professor Barry Smith (University of London), Robert Francis (PhD student/writer), Kerry Hadley-Pryce (PhD student/writer), Professor Sebastian Groes (University of Wolverhampton School of Humanities) and Dr Tom Mercer (Psychology Lecturer University of Wolverhampton).